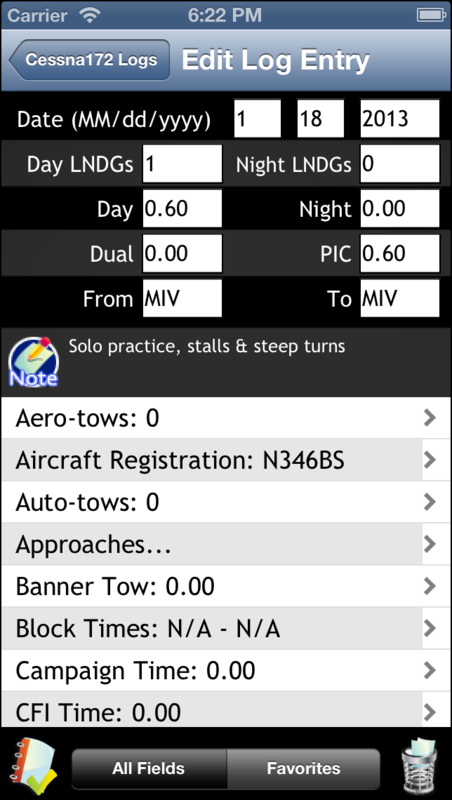 Today I pushed an update to Apple that I’m sure a lot of users have been waiting for; FlightLog will now work great on your taller iPhone 5 phones! I have also gone through many of the screens and have updated them to look nicer. I know that I still have more work to do with this and will be spending more time with this going forward, but I hope you like what I’ve done so far. It may still take Apple up to a week to approve the update, but once you see it please let me know what you think. Below are some screenshots of the interface. 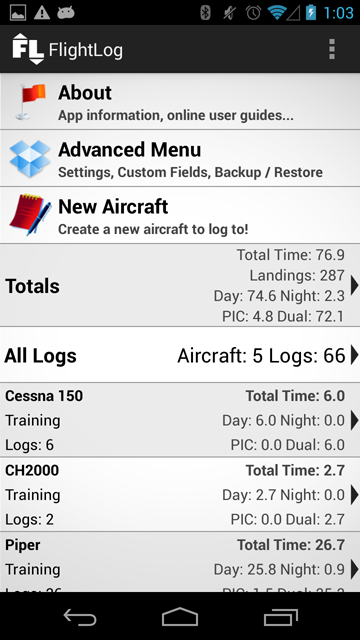 I’ve been using android a lot lately, and one thing I’ve really missed from my old iPhone was my FlightLog app. This sparked me to build a version for android, and the first version is available on the Google Play store! 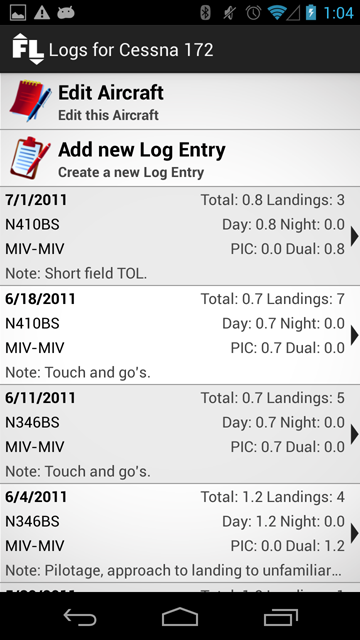 I’ve approached the android version of FlightLog quite a bit differently than I did with my iOS one. On iOS I started with a very simple app built for my needs, and later started tacking on all kinds of fields and features that were requested by other users thinking that I’d be able to cover all of the bases that way. The requests never stopped coming and managing everything became unwieldy. Right out of the gate I wanted to address these issues for the android version and make a simple app as flexible as possible. 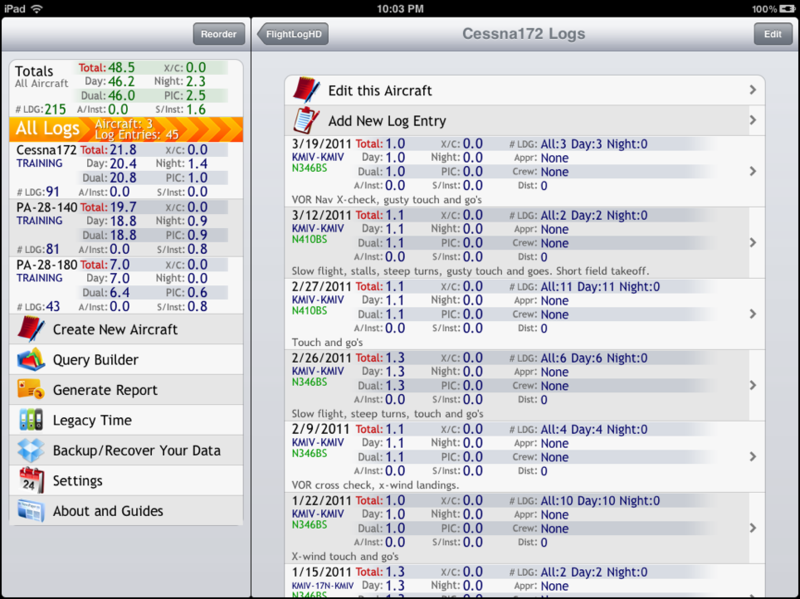 Soon I’ll take this approach and rebuild FlightLog for iOS from the ground up with everything I’ve learned. 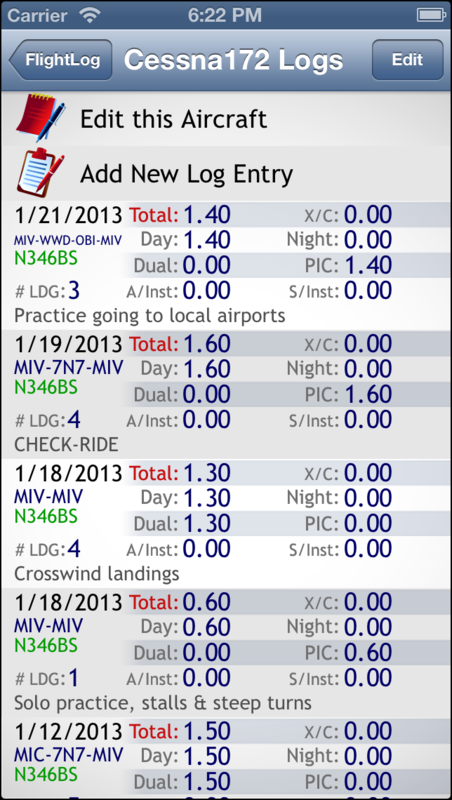 FlightLog for android uses a SQLite database to store your data. It stores data differently to prevent rounding errors that could be caused from different methods of entering and converting data. And, most importantly, it allows users to create their own fields! 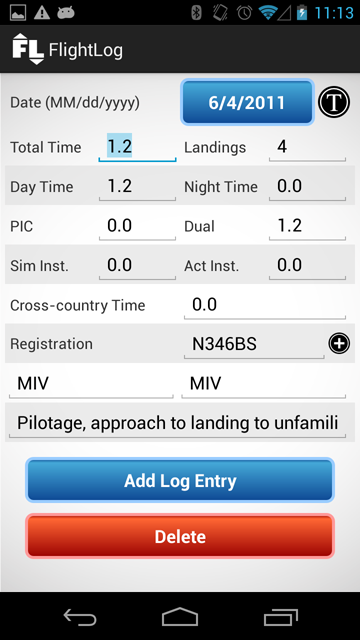 FlightLog for android comes with a very small subset of fields that are common among all pilots, and the user can create whatever fields they want to track other data. These fields will accumulate totals just like the built in fields, etc. Dropbox backup and recovery is built in so that you can keep your data safe in the cloud as well as utilize multiple android devices for managing your flight time. (The backup files between iOS and android are not compatible at this time). Another great thing is that FlightLog for android has a clean new interface that I’ll try to be adopting across more of my apps. 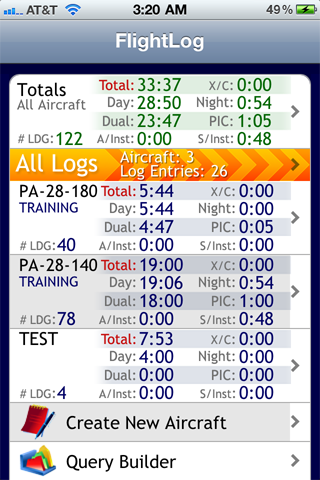 I have more work to do with FlightLog on android to get all of the features the iOS variant has. But I have a very solid foundation to build off of, and I think you’ll love it! Let me know! FlightLogHD has just been released! 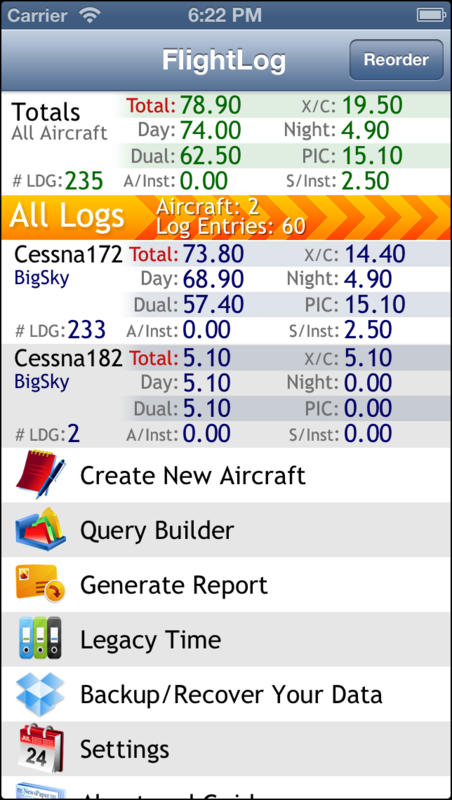 FlightLogHD brings the log management and analysis tools of FlightPlan to the iPad, and utilizes the larger screen to make it easier than ever to manage flight time. From the original version of FlightLog simply log in to the Backup/Recover feature and tap “Backup to Dropbox”. Then, from FlightLogHD on your iPad log in to the Backup/Recover feature and tap “Recover from Dropbox”. Simple as that! 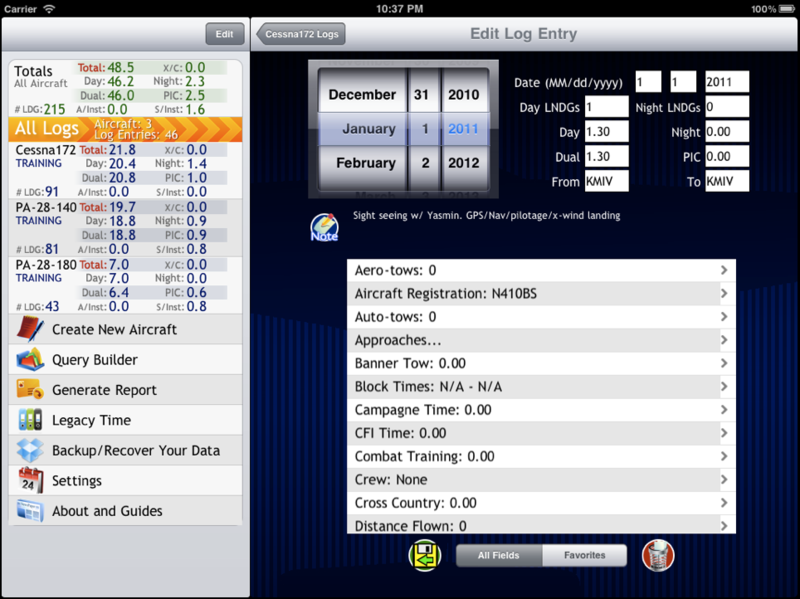 As many of you know I’ve been working on preparing an iPad native version of FlightLog. This version will be designed to take advantage the beautiful screen of our iPads! I’m getting closer to completing the initial version of this project and I thought I would post a couple pictures of what screens may look like. Please note that these screen may not represent what the final released version will look like, but are presented to demonstrate how the larger screen will be utilized to aid in entering / displaying data. FlightLog 3.4 has been submitted to Apple! This update brings the new “Legacy Time” entry screen that will allow bulk entry of previously obtained hours. I did receive a lot of requests for this feature, however, so I decided to make the option available to users if they want to use it. I welcome feedback from users if they have ideas on how to improve the functionality of this and other features. Thank you all for writing me with your feedback about my software, and your patience while I do my best to get your requests completed. Exciting Feature for FlightLog Coming! I want to let everyone know that the number one requested feature will indeed see the light of day, and sooner than later! A smaller patch should hit your phones in the next couple of days, but as soon as that clears I’m ready to submit the “big ‘un”. How does manual data backup from FlightLog sound? How about backup to the cloud? Even better? Wait ‘till you hear this next part-How about online data backup to the cloud and it being absolutely free? 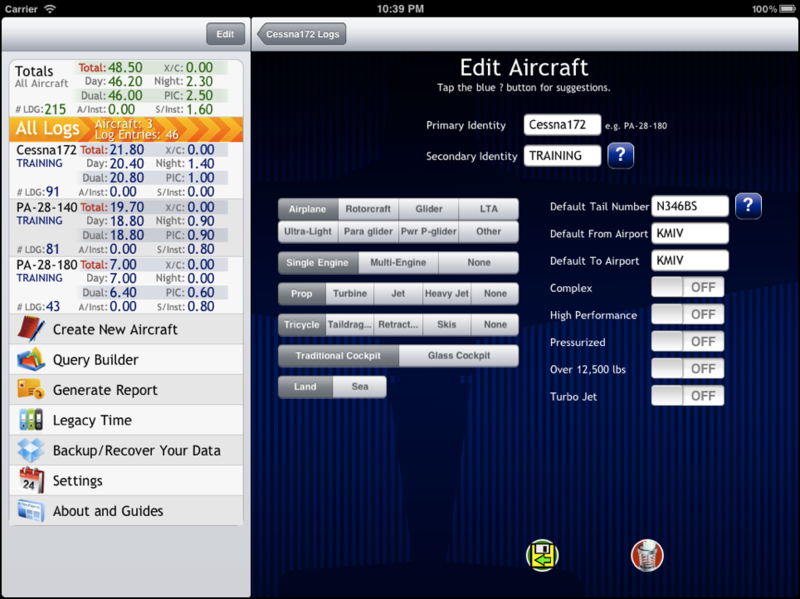 How about being able to import your data on other devices running FlightLog, such as your iPad? How is that for a free update? I know it has taken me a lot of time to get backup functionality out to you but I needed to make sure it was done right. Free and low maintenance were requirements and it is ready to go. I’m sure I’ll receive a lot of feedback once it hits people’s devices and it will continue to improve from there. I also want to say thank you to everyone for your continued support and enthusiasm about FlightLog. Your feedback is shaping it to be the best logging app for flight time, and it will only get better. I’ve been telling people that I’m working on a huge update to FlightLog and so I need to push off feature enhancements until the huge update is completed. I’m very happy to announce that huge update is almost ready! This update has been a monster for me to complete. I’ve sunk tons and tons of time into it. Visually FlightLog only looks slightly different, but under the hood I’ve re-architected the log memory management system to better handle large data-sets. Hi everyone, I owe you all an update. I’ve received a lot of feedback for FlightLog, and I’ve told most of you that I’m in the middle of a huge architecture change but didn’t know when I’d finish it. I have a bit more info on that front. First off, there is an update for FlightLog submitted. This has a few minor updates in it, most notably the ability for FlightLog to open right where you left it off if you are running iOS4. I’m hoping that compiling this for iOS4 will relieve some of the performance issues some iPhone 3G owners saw after they upgraded their OS. This update will likely be out within 5 days or so. The larger architecture change...I’ve been working on this update for a couple months now. I’ve had a lot of real life distractions along the way too, which hasn’t helped any. But I did reach a milestone tonight with this update. I’ve completed most of the handling of data, including adding/editing aircraft and logs, and also the query builder...All of these systems will utilize your data in a way where it will use a lot less memory. I still have to do the report generation and A LOT of testing, but I can see the light at the end of the tunnel! I don’t feel comfortable giving out a timeframe yet. I’d like to say I’ll have it submitted in 2 weeks time, but I don’t like to make promises I can’t keep. So, we’ll leave it at “I’m hoping to get it submitted within the next couple weeks”. Sorry for the delay in getting this completed. I know some of you are waiting on features you have requested, and I’ll be getting back to adding new features once this big update is done. FlightScale: I just submitted an update tonight for FlightScale that will allow you to use up to 7 limit points now in your envelope. Judging from Apple’s recent approval process, expect this to hit your iPads in about 5-6 days. 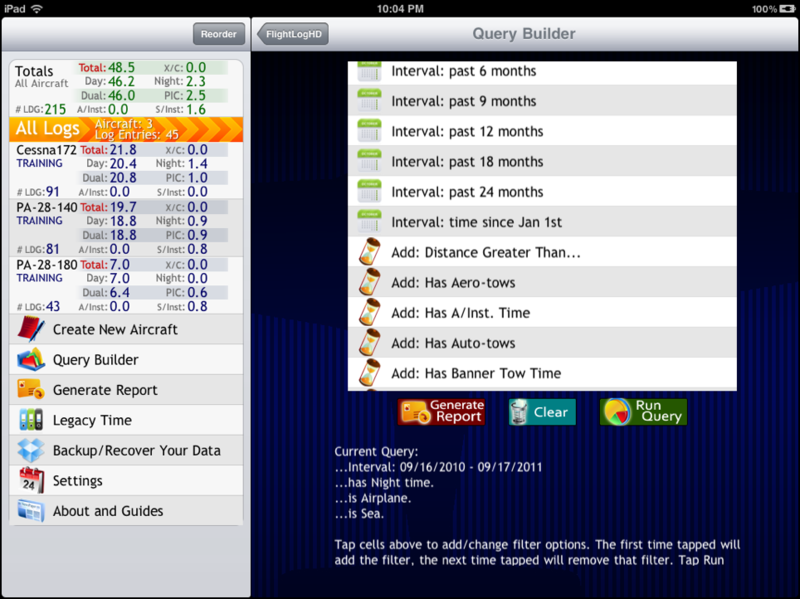 FlightPlan (iPhone): I’m getting some good enhancements in FlightPlan that frankly should have been integrated long ago. A lot of older calculations aren’t heeding the setting changes for your units, and I’ve been fixing them up to do so. I’ve been finding these by doing testing while developing the android version of FlightPlan, so it really will help improve both products. FlightPlan (android): I’m still making progress on the initial release of FlightPlan for android, but I’m still a ways off from submitting it to the market. I’ll try to check in again in 2 weeks to see where I’m at; I’m hoping to be pretty close to the initial release in 2 weeks but with family coming to visit...you never know. 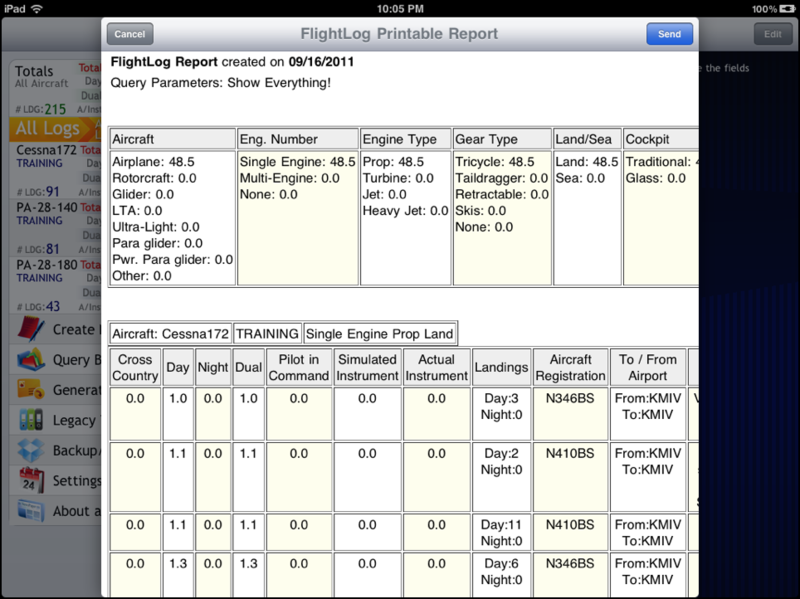 FlightLog: I’ve started re-architecting how FlightLog handles its data. Namely, I have a few users that are really pushing FlightLog to the limits of their older iPhones and they are having memory issues. When I complete this big update, they will have issues no longer. I’m still a couple weeks out from completing this as well. If you are having trouble generating FlightLog reports, meaning that FlightLog crashes when you hit the generate button, and you have FlightLog version 1.4.6 or later, please try the following. If you have an earlier version, please update FlightLog and then do the following. This will reset your report generation settings, such as your column order and visibility, but it should restore your ability to generate reports. 1. Type “reset” into the field where your email address goes on the report options screen. 4. Replace your email address in the email field, tap “Generate Report” again, this should complete successfully. If this does not fix your problem please contact me immediately. This is a very important update that fixes an important issue with the v1.5.0 update. Please look for this on the app store. I have just submitted the 1.5.0 update to Apple. Apple’s approval time has been getting better lately, and we may see this go out as soon as a couple days from now! I wasn’t able to get all of the new features I plan to add into this update, but this update is still very big. Read about the specific changes here on the forum post. The major enhancement in this update is the ability to mark your favorite fields so they are easier to find when logging your entries. FlightLog has been receiving a lot of attention lately. This is mostly because I have been receiving so much feedback for it. I have some big enhancements I want to get integrated. I am not sure if I can get them all in for the next update, but these are all things that should all be available soon.